Installation and Configuration Manager (ICM) – cluster installation, upgrade, and expansion tools. GP Command Center – visual interface for cluster health, system metrics, and job monitoring. Hadoop Virtualization Extension (HVE) – enhances Hadoop to support virtual node awareness and enables greater cluster elasticity. GP Data Loader – parallel loading infrastructure that supports “line speed” data loading into HDFS. Isilon Integration – extensively tested at scale with guidelines for compute-heavy, storage-heavy, and balanced configurations. 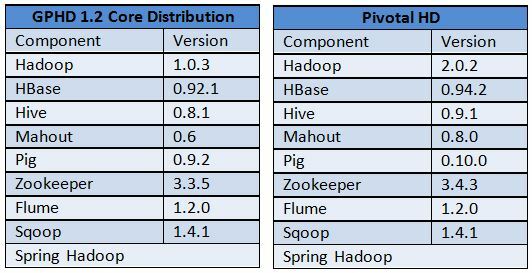 Advanced Database Services (HAWQ) – high-performance, “True SQL” query interface running within the Hadoop cluster. Extensions Framework (GPXF) – support for HAWQ interfaces on external data providers (HBase, Avro, etc.). Advanced Analytics Functions (MADLib) – ability to access parallelized machine-learning and data-mining functions at scale. YARN – has the old MapReduce 1.0 algorithm as well as the new YARN (also known as MapReduce 2.0) algorithm as Pivotal HD has the Hadoop 2.0.2 core.